Last Date: 30 Days from the Date of Advt. How to apply:: Interested candidates are requested to apply online by 13/09/2016 till 5.00 pm and send us the typed application on A4 size paper along with the Registration number obtained while filling online application from our web page at http://www.ipr.res.in/advertisements.html with one recent passport size photograph duly affixed on the right hand top corner of the application alongwith copies of testimonials in support of Age, Qualification and Work Experience, etc. so as to reach The Acting Chief Administrative Officer, Institute for Plasma Research at the above address on or before 20/09/2016. The envelope should be superscribed with Advt. No. and Post Applied for. criteria and the instructions to apply online. 1700 Hrs on 10.09.2016 for this purpose. How to apply:Eligible candidates fulfilling the educational qualification and experience etc. may appear for the walk-in-interview on 15th September, 2016 at 9.30 A.M. at National Centre for Disease Control, 22-Sham Nath Marg, (near Civil Line Metro Station), Delhi- 110 054. Eligible candidates may register their names for interview between 9.30 A.M. to 10.30 A.M. on the date mentioned above along with a resume, original certificates and their attested copies. Registration will be closed at 10.30 A.M. sharp. Candidate reporting after 10.30 A.M. will not be entertained. Qualification:Masters in Technology/Management from a premium institution or University. entrepreneurial experience would be preferred.  Must have very strong PR &amp; networking skills and a dynamic personality.  Compensation will be competitive (salary+equity) and a very high level of autonomy. or entrepreneurship &amp; allied activities.  Fluent in spoken and written English. candidate is found otherwise suitable. How to apply:Interested candidates including the Guest Lecturers already working in the Centre may send their applications duly filled in along with the copies of certificates in support of the education ( from M.A. onwards) and experience to the Chairperson, Room No. 327, Centre of Russian Studies, School of Language, Literature &amp; Culture Studies, JNU, New Delhi – 110067 by 19th August, 2016.
postal delay in receipt thereof on any account whatsoever. these activated during the process of selection. i. PWD Certificate as per latest format (if applicable). Ltd., RITES Bhawan, Plot No.1, Sector-29, Gurgaon – 122001, Haryana”. manual/ paper application will be entertained. passport size colour photograph and their signature in jpeg format. Educational Qualification: Candidates should possess MBBS for S.No-1, BDS for S.No-2, B.Sc (Medical Lab Technology) for S.No-3, B.Pharmacy from a recognized Institute for S.No-4 &amp; for other refer notification. How to Apply: Eligible candidates send their application in the prescribed format through e-mail to echscelltrichy@yahoo.com; shqtirpalli@echs.gov.in on or before 01-10-2016 &amp; attend for interview on 05-10-2016 at 09.00 hrs. 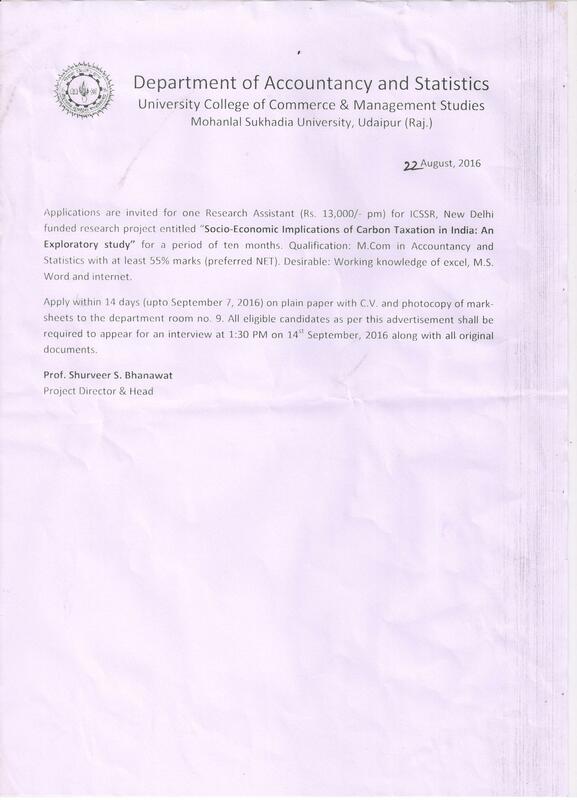 Last Date for Submission of Application: 01-10-2016. Date &amp; Time of Interview: 05-10-2016 at 09.00 hrs. Venue: Station HQ, Garuda Lines, Cantonment, Trichy. How to Apply: Eligible can apply in the prescribed format within 21 days &amp; 28 days for remote areas from the date of advertisement. Age Limit: Candidate age limit is 22 to 40 years as on 20-09-2016. Educational Qualification: Candidates should possess Bachelor/ Diploma of Engineering (Civil) with relevant experience. How to Apply: Eligible candidates can send their application in prescribed format along with self attested true copies of proof of age/ date of birth academic, professional qualification, caste certificate &amp; experience, 02 latest passport size photographs, superscribe envelope containing application with “Application for the post of _____” by registered post/ speed post to Office of Cantonment Board, Deolali, Dist Nashik, Pin 422401 (Maharashtra) on or before 20-09-2016 by 16:00 Hours. Last Date for Submission of Application: 20-09-2016 by 16:00 Hours. documents will be required for uploading and final submission of Online Application. etc. will be considered as Final and NO further modifications will be allowed/entertained.